This topic contains 56 replies, has 2 voices, and was last updated by Hudson Atwell 2 months, 1 week ago. I share with you some doubts relative to your software. When I create a view rule, is there any difference related to the users “if he is registered like WP user or not? Does it affect the rule? I have a small petition. Can you create the option to add rules into folder and subfolder? I am researching your software and it seems that I can manage the school with it but I have to create a lot of rules and it can be a bit confusing. Creating folder and subfolder It can be more affordable. Take into account that I have to move leads across all the course process creating rules to every topic he visit. 1) if a user is registered and visit a page, and I want to add a tag after to visit a page should I choose trigger on lead updated or tracked page view content? Does it affect the rule? When we have the user’s data in WordPress but it has not login yet, right? In this case, for example if he visit a page, what should I do to add a tag? Choose tracked page or On lead updated? if you are not registered and do a visit, how is this situation handled? The sistem create a possible lead or not? Is this tracked? In the case that users not registered yet be recorded y your sistem, can I created a rule to add a tag? If is ok, then the user will be added here (https://prnt.sc/mhbuv9 ) how long I must wait until the user be added? If defer processing for the rule is disabled then it should add the tag to the lead immediately. If defer processing is turned on then it should take 1-3 minutes from the time of the action. This rule will only work if your site knows the visitor is a lead. In order for the site to know who is a lead they either have to log in, have fill out a tracked form, or clicked a tracked email link (this last one may need attention to make sure it works). I ran a test locally, though, and noticed my lead was not tagged and there is a bug related to the new ‘Tracked Page View Event’ and the tag action. I’m fixing the bug now and the fix will be in the next release. Due soon. We’re limited to what WordPress offers when it comes to organizing Rules. We could ad a category system to rules, where then admin could filter by category like they can with blog posts and pages. Would this offer a solution? Page view event and setup conditions to only apply rule when the page_id is equal to your target. They have to log in to set our tracking cookie, or visit from a device that already has the tracking cookie. We can also have it if they click an email link they are re-entered into the system. Assuming the visitor is a tracked lead then we’d use the page view event trigger. This data is stored in our inbound_page_views table, but it’s anonymous. We can’t do anything with it. When performing rules at this level it’s important to make sure traffic is logged in so they can be tracked properly. No we can’t tag visitors without lead profiles, or visitors who’s lead id is not re-cookied. Hi, well, I think it could work. I need a way to add rules to a category to organize it properly. For example in this way I can create several rules focus in an item like (tag users that visit pages not the courses). I could put all this rules inside a category. 1)	Is not possible to track users unlogged (with an account but not login yet). I mean, In all the cases is necesary that users begin sesion. The sistem do not track the activity previus to login althoug they have an account like lead. 2)	Is not possible to track users without lead profiles. So, in order to track lead behaviur or trigger rules the condition is clear : the lead need to be log (active login in WordPress), that s all. If I am right, then I am going to develop this function by my own becouse I need to track user behaviur before to login and to sign up becouse this information can be useful to improve the ROI. *If you want, I can share with you the code after develop it. For me is ok.
¿Can you confirm if this rule is ok? Trigger: tracked view page event. Add or remove a tag. In this rule, I understand that a tag will be added to a tag if the lead is log (active login in WordPress). Sorry for all this questions. I write with a high frecuency but for me the information is not easy to understand and of course, I am going to invest money getting traffic, so I need to be sure about every step. I’ve added the initiative to my to-do list. Can I help in any way? If you give me instructions I can hire a developer to created code based in your specifications. For me is ok. Just trying to save time. It could be 1-2 weeks for this otherwise. It’s not a large request, but I have to work it in, inbetween my client work. I could have the feature in by Friday/Saturday if funded. Cost for this addition is most likely ~100USD. Happy to hire you. Just to confirm. 1) You are going to add the function to track users registereds but with a WP unactive account. This function will leave us to add tags when they visit post, pages an so on. 2) All the visits will be tracked (users with account and without account), if the users without account decide to register after 2 or 3 days, all this information will be added to their profile. 3) You will create the categories and subcategories that are useful to organice the rules. I have create the project in Codeable but I am sure about how to pay. Also you have to define the develop time, I guess, I am not sure about how to do it. No I’m sorry. We’ll never be able to track visitors that do not have a lead cookie. In order to tag visitors we have to know who they are. We do store impression data, but it will be considered anonymous. Let’s talk about this more though to build understanding. If a user has a lead profile and logs into WP, they are tracked. If a user clicks an email link sent to them, they should be tracked. Feel free to keep asking questions about this. If your user uses an tracked Inbound Form to register, their anonymous data should transfer over to their lead profile, but they will not be tagged unless we already know how they are. Inside automation there is a section called ‘Action conditions’ where you can check to see if they have viewed a page. 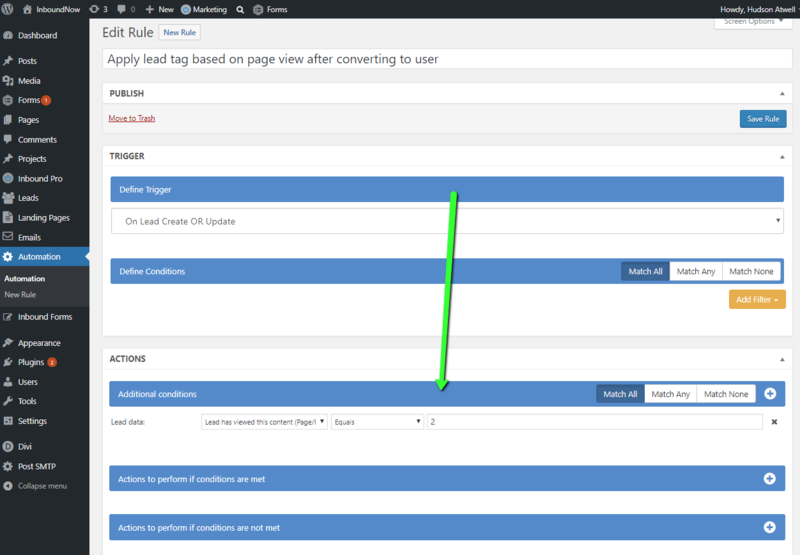 I have not tried it, but maybe you can set up a rule to run at ‘On Lead Create OR Update’ that checks if a lead has viewed a specific page and if it has, then tag that lead. That way anonymous page views that became associated with a newly created lead profile are then tagged with your tag. This I can do ahead of time. When/if you created a Codeable project will you link it to me privately?. The topic ‘[Marketing Automation] Doubt about MARQUETING AUTOMATION’ is closed to new replies.